As part of their innovative thinking, Reydon Sports are always looking for ways to remain competitive in the wholesale sports equipment market. The team at Reydon continuously develop ideas on how to expand their marketing exposure. It was a courtesy call from Textlocal’s sales team member Seb which introduced them to the benefits of SMS. Reydon has found the scheduling aspect of Textlocal’s platform a key benefit of the service. The attachment tool also enables the marketing team to share images and additional details of promotions with their customers for added impact. 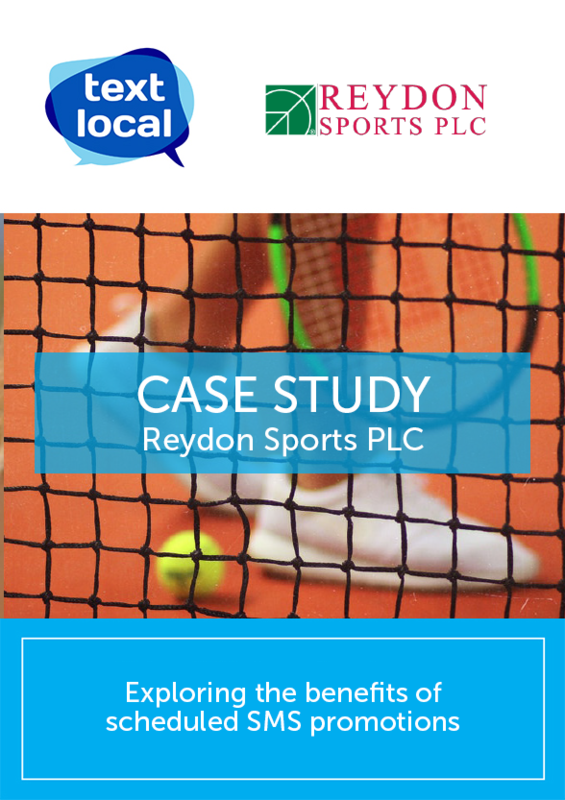 Since signing up with Textlocal, Reydon Sports now schedule and send an offer to their customers on a weekly basis. Additionally, the team also now use SMS for two of their companies due to the simplicity of it all. Andy also mentioned that despite the introduction of GDPR last year being a scary prospect for many, the ability to add a simple unsubscribe option within Textlocal’s SMS has helped dramatically. Easiest software to use and I am fully in control of how I want to execute my text distribution which is fantastic. Seb initially set me up on this and has been so supportive from day one. I also have a new account manager Will who is equally friendly.